This article is about the French explorer. For the French priest of that era with the same surname for whom La Salle University is named, see Jean-Baptiste de La Salle. Sieur de La Salle is a French title roughly translating to "Lord of the manor", from the old French sal(e) (modern salle), "hall", a manor house. Sieur is a French title of nobility, similar to the English "Sir", but under the French Signeurial system, the title is purchased rather than earned, and does not imply military duty. It refers to Robert Cavelier's Signeurial purchase of Lachine from the Sulpician order at Ville Marie around 1667. The phrase La Salle has become iconic, and associated with the person as if it were his name, in expressions such as Robert La Salle, or simply "La Salle". 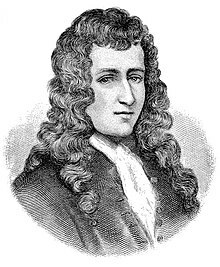 Robert Cavelier was born on November 22, 1643, into a comfortably well-off family in Rouen, France, in the parish Saint-Herbland. When he was younger, he enjoyed science and nature. As a man, he studied with the Jesuit religious order and became a member after taking initial vows in 1660. [a] At his request on March 27, 1667, after he was in Canada, he was released from the Society of Jesus after citing "moral weaknesses." Although he left the order, never took final vows in it, and later became hostile to it, historians sometimes described him incorrectly as a priest or a leader. La Salle never married, but has been linked to Madeleine de Roybon d'Allonne, an early settler of New France. His older brother, Jean Cavelier, was a Sulpician priest. His parents were Jean Cavelier and Catherine Geest. Required to reject his father's legacy when he joined the Jesuits, La Salle was nearly destitute when he traveled as a prospective colonist to North America. 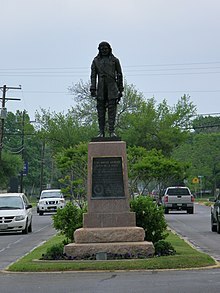 He sailed for New France in the spring of 1666. His brother Jean, a Sulpician priest, had moved there the year before. He was granted a seigneurie on land at the western end of the Island of Montreal, which became known as Lachine. [b] La Salle immediately began to issue land grants, set up a village and learn the languages of the native people, several tribes of Iroquois in this area. The Seneca told him of a great river, called the Ohio, which flowed into the sea, the "Vermilion Sea".[d]. He began to plan for expeditions to find a western passage to China. He sought and received permission from Governor Daniel Courcelle and Intendant Jean Talon to embark on the enterprise. He sold his interests in Lachine to finance the venture. La Salle left Lachine by the St. Lawrence on July 6, 1669 with a flotilla of nine canoes and 24 men, plus their Seneca Indian guides: himself and 14 hired men in 4 canoes, the two Sulpicians Dollier de Casson and Abbé René de Bréhan de Galinée with 7 new recruits in three canoes, and two canoes of Indians. There they went up the St. Lawrence and across Lake Ontario. After 35 days, they arrived at what we call today, Irondequoit Bay on the southern shore of Lake Ontario at the mouth of Irondequoit Creek, a place now commemorated as "La Salle's Landing". There they were greeted by a party of Indians, who escorted them starting the next day to a village some leagues distant, a journey of a few days. At the village, the Seneca vehemently attempted to dissuade the party from proceeding into the lands of their enemies, the Algonquins, telling of the dire fate awaiting them. The necessity of securing guides for the further part of the journey, and the obstinacy of the Seneca to provide them, delayed the expedition a month. A fortuitous capture by the Indians in the lands to the south of a Dutchman who spoke Iroquois well but French ill, and was to be burned at the stake for transgressions unknown, provided an opportunity to obtain a guide. The Dutchman's freedom was purchased by the party in exchange for wampum. While at the Indian village in Sept. 1669, La Salle was seized with a violent fever[e] and expressed the intention of returning to Ville Marie. At this juncture, he parted from his company and the narrative of the Jesuits, who continued on to upper Lake Erie.The missionaries continued on to the upper lakes, to the land of the Potawatomies. Other accounts have it that some of La Salle's men soon returned to New Holland or Ville Marie. Beyond that, the factual record of La Salle's first expedition ends, and what prevails is obscurity and fabrication. It is likely that he spent the winter in Ville Marie. The next confirmed sighting of La Salle was by Nicolas Perrot on the Ottawa River near the Rapide des chats in early summer, 1670, hunting with a party of Iroquois. That would be 700 miles as the crow flies from the Falls of the Ohio, the point supposed by some that he reached on the Ohio River. La Salle's own journal of the expedition was lost in 1756. Two indirect historical accounts exist. The one, Récit d’un ami de l’abbé de Galliné, purported to be a recitation by La Salle himself to an unknown writer during his visit to Paris in 1678, and the other Mémoire sur le projet du sieur de la Salle pour la descouverte de la partie occidentale de l’Amérique septentrionale entre la Nouvelle-France, la Floride et le Mexique. A letter from Madeleine Cavelier, his now elderly niece, written in 1746, commenting on the journal of La Salle in her possession may also shed some light on the issue. La Salle himself never claimed to have discovered the Ohio River. In a letter to the intendent Talon in 1677, he claimed discovery of a river, the Baudrane, flowing southwesterly with its mouth on Lake Erie and emptying into the Saint Louis (i.e. the Mississippi), a hydrography which was non-existent. In those days, maps as well as descriptions were based part on observation and part on hearsay, of necessity. This confounded courses, mouths and confluences among the rivers. At various times, La Salle invented such rivers as the Chucagoa, Baudrane, Louisiane (Anglicized "Saint Louis"), and Ouabanchi-Aramoni. These included segments of those he'd actually traversed, which were earlier the Illinois and Kankakee, St. Joseph's of Lake Michigan, probably the Ouabache (Wabash) and possibly the upper Allegheny and later, the Chicago and lower Mississippi. He also correctly described the Missouri, though it was hearsay - he'd never been on it. Confounding fact with fiction started with publication in 1876 of Margry's Découvertes et Etablissements des Français. Margry was a French archivist and partisan who had private access to the French archives. He came to be the agent of the American historian Francis Parkman. Margry's work, a massive 9 volumes, encompassed an assemblage of documents some previously published, but many not. In it, he sometimes published a reproduction of the whole document, and sometimes only an extract, or summary, not distinguishing the one from the other. He also used in some cases one or another copies of original documents previously edited, extracted or altered by others, without specifying which transcriptions were original, and which were copies, or whether the copy was dated earlier or later. Reproductions were scattered in fragments across chapters, so that it was impossible to ascertain the integrity of the document from its fragments. Chapter headings were oblique and sensational, so as to obfuscate the content therein. English and American scholars were immediately skeptical of the work, since full and faithful publication of some of the original documents had previously existed. The situation was so fraught with doubt, that the United States Congress appropriated $10,000 in 1873, which Margry wanted as an advance, to have the original documents photostated, witnessed by uninvolved parties as to veracity. If La Salle is excused from discovering the two great rivers of the midwest, history does not leave a void. On May 8, 1541, south of present-day Memphis, Tennessee, Spanish conquistador Hernando de Soto reached the Mississippi River, which the Spanish called the Rio Grande for its immense size. He was the first European to document and cross the river, though not traverse it. It is uncontested that Louis Joliet and Jacques Marquette were the first Europeans to traverse the upper Mississippi in 1673, and that Father Louis Hennepin and Antonine Augalle visited the Falls of St. Anthony on the upper Mississippi in spring, 1680, in advance of La Salle's own excursion in early 1682.
Credit for discovery of the Ohio River is provisionally given to two obscure early English explorers, Thomas Batts and Robert Fallam from Virginia who visited Wood's River (today called the New River), a tributary of the Ohio via the Kanawha, in what is today West Virginia in Sept. 1671. Other scholars declaim that this short (one month) expedition did not penetrate to the Ohio to the west, but elect instead Virginia Englishmen James Needham and Gabriel Arthur who in 1673-74 circumnavigated the southeast finally traversing Shawnee villages along the Ohio. The lower Ohio River first began appearing on French maps about 1674 in approximately its correct hydrography, and in its relation to the Mississippi, though diagrammed more northerly, approaching Lake Erie from the west and may have been confounded with the Maumee portage route. A memoir by M. de Denonville in 1688, recites that the lower Ohio, at least from its confluence with the Wabash to the Mississippi, was a familiar trade route. In 1692, Arnout Viele, a Dutchman from New York, traversed the length of the Ohio from the headwaters of the Allegheny in Pennsylvania to it's mouth on the Mississippi, though the hydrography of the Allegheny remained opaque for at least several decades thereafter. On July 12, 1673, the Governor of New France, Louis de Buade de Frontenac, arrived at the mouth of the Cataraqui River to meet with leaders of the Five Nations of the Iroquois to encourage them to trade with the French. While the groups met and exchanged gifts, Frontenac's men, led by La Salle, hastily constructed a rough wooden palisade on a point of land by a shallow, sheltered bay. Originally the fort was named Fort Cataraqui but was later renamed Fort Frontenac by La Salle in honor of his patron. The purpose of Fort Frontenac was to control the lucrative fur trade in the Great Lakes Basin to the west. The fort was also meant to be a bulwark against the English and Dutch, who were competing with the French for control of the fur trade. La Salle was left in command of the fort in 1673. 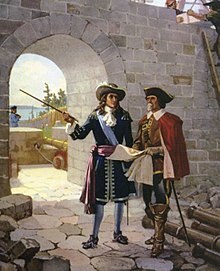 Thanks to his powerful protector, the discoverer managed, during a voyage to France in 1674–75, to secure for himself the grant of Fort Cataraqui and acquired letters of nobility for himself and his descendants. 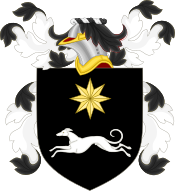 With Frontenac's support, he received not only a fur trade concession, with permission to establish frontier forts, but also a title of nobility. He returned and rebuilt Frontenac in stone. An Ontario Heritage Trust plaque describes La Salle at Cataraqui as "[a] major figure in the expansion of the French fur trade into the Lake Ontario region, Using the fort as a base, he undertook expeditions to the west and southwest in the interest of developing a vast fur-trading empire." Henri de Tonti joined his explorations as his lieutenant. In early 1679, La Salle's expedition built Fort Conti at the mouth of the Niagara River on Lake Ontario. There they loaded supplies from Fort Frontenac into smaller boats (canoes or bateaux), so they could continue up the shallow and swiftly flowing lower Niagara River to what is now the location of Lewiston, New York. There the Iroquois had a well-established portage route which bypassed the rapids and the cataract later known as Niagara Falls. The first ship built by La Salle, called the Frontenac, a 10-ton single-decked brigantine or barque was lost in Lake Ontario, on January 8, 1679. Afterward, La Salle built Le Griffon, a seven-cannon, 45-ton barque, on the upper Niagara River at or near Cayuga Creek. She was launched on August 7, 1679. La Salle sailed in Le Griffon up Lake Erie to Lake Huron, then up Huron to Michilimackinac and on to present-day Green Bay, Wisconsin. Le Griffon left for Niagara with a load of furs, but was never seen again. He continued with his men in canoes down the western shore of Lake Michigan, rounding the southern end to the mouth of the Miami River (now St. Joseph River), where they built a stockade in January 1680. They called it Fort Miami (now known as St. Joseph, Michigan). There they waited for Tonti and his party, who had crossed the Lower Michigan peninsula on foot. Tonti arrived on November 20; on December 3, the entire party set off up the St. Joseph, which they followed until they had to take a portage at present-day South Bend, Indiana. They crossed to the Kankakee River and followed it to the Illinois River. There they built Fort Crèvecoeur, which later led to the development of present-day Peoria, Illinois. La Salle set off on foot for Fort Frontenac for supplies. While he was gone, the soldiers at Ft. Crevecoeur, led by Martin Chartier, mutinied, destroyed the fort, and exiled Tonti, whom he had left in charge. He[who?] later captured most of the mutineers on Lake Ontario, before rendezvousing with Tonti at St. Ignace, Michigan. La Salle reassembled a party for another major expedition. In 1682 he departed Fort Crevecoeur[disputed – discuss] with a group of Frenchmen and Indians and canoed down the Mississippi River. He named the Mississippi basin La Louisiane[not in citation given] in honor of Louis XIV and claimed it for France. At what later became the site of Memphis, Tennessee, he built the small Fort Prudhomme.[why?] 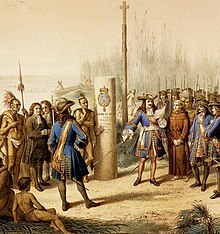 On April 9, 1682, at the mouth of the Mississippi River near modern Venice, Louisiana, he buried an engraved plate and a cross, claiming the territory for France. In 1683, on his return voyage, La Salle established Fort Saint-Louis of Illinois, at Starved Rock on the Illinois River, to replace Fort Crevecoeur. He appointed Tonti to command the fort while he traveled to France for supplies. On July 24, 1684, he departed France and returned to America with a large expedition designed to establish a French colony on the Gulf of Mexico, at the mouth of the Mississippi River. They had four ships and 300 colonists. The expedition was plagued by pirates, hostile Indians, and poor navigation. One ship was lost to pirates in the West Indies, a second sank in the inlets of Matagorda Bay. They founded a settlement, near the bay which they called the Bay of Saint Louis, on Garcitas Creek in the vicinity of present-day Victoria, Texas. La Salle led a group eastward on foot on three occasions to try to locate the mouth of the Mississippi. In the meantime, the flagship La Belle, the only remaining ship, ran aground and sank into the mud, stranding the colony on the Texas coast. During a final search for the Mississippi River, some of La Salle's remaining 36 men mutinied, near the site of present Navasota, Texas. [f] On March 19, 1687, he was slain by Pierre Duhaut during an ambush while talking to Duhaut's decoy, Jean L'Archevêque. They were "six leagues" from the westernmost village of the Hasinai (Tejas) Indians. Duhaut was killed to avenge La Salle. The remaining men in the party, afraid of retribution, killed each other, except for two. The colony lasted only until 1688, when Karankawa-speaking Native Americans killed the 20 remaining adults and took five children as captives. Tonti sent out search missions in 1689 when he learned of the settlers' fate, but failed to find survivors. The children of the colony were later recovered by the Spanish. 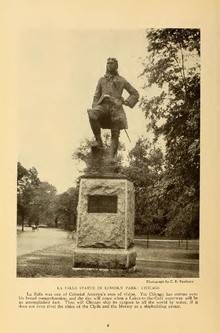 Statue of La Salle in Lincoln Park, Chicago, as seen in the January 1919 issue of National Geographic Magazine. 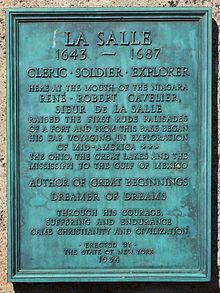 Bronze plaque honoring LA SALLE, at Old Fort Niagara, NY. In addition to the forts, which also served as authorized agencies for the extensive fur trade, La Salle's visits to Illinois and other Indians cemented the French policy of alliance with Indians in the common causes of containing both Iroquois influence and Anglo-American settlement. He also gave the name Louisiana to the interior North American territory he claimed for France, which lives on in the name of a US state. In 1995, La Salle's primary ship La Belle was discovered in the muck of Matagorda Bay. It has been the subject of archeological research. Through an international treaty, the artifacts excavated from La Belle are owned by France and held in trust by the Texas Historical Commission. The collection is held by the Corpus Christi Museum of Science and History. Artifacts from La Belle are shown at nine museums across Texas. The wreckage of his ship L'Aimable has yet to be located. The possible remains of Le Griffon were found in 1898 by lighthouse keeper Albert Cullis, on a beach on the western edge of Manitoulin Island in northern Lake Huron. Results of testing some of the artifacts were disputed. Many of the recovered artifacts were lost and the wreck was washed away in 1942. A possible shipwreck of Le Griffon near Poverty Island at the entrance to Green Bay in northern Lake Michigan was located by Steve Libert of the Great Lakes Exploration Group in 2001. The organization prevailed in a lawsuit against the state of Michigan over ownership of artifacts in 2012, and in 2013 was issued a permit to excavate the wreck. Only one artifact, a wood pole, was recovered, and it is indeterminate whether it was from a shipwreck. LaSalle, Quebec is a borough of the city of Montreal, Quebec, Canada. LaSalle County, Illinois, the city of LaSalle and the La Salle Speedway within it. The LaSalle Expressway, a roadway through Niagara Falls, New York and its outer suburbs. LaSalle Street, a north-south thoroughfare in Chicago, leads directly to the Board of Trade, and is the center of Chicago's financial district. The La Salle Causeway, connecting Kingston, Ontario to neighbouring Barriefield, Ontario. La Salle Avenue, a downtown street in Minneapolis, Minnesota. Avenue La Salle, located in Shawinigan, Quebec, Canada. La Salle Street in Navasota, Texas. It also contains a statue given by the French Government in honor of the explorer. Lasalle Road, an east-west road to the south of Sarnia, Ontario, Canada. LaSalle Avenue, a thoroughfare in South Bend, Indiana, which traverses the downtown area and carries a portion of U.S. Route 20 Business. La Salle Avenue in Waco, Texas. Robert LaSalle County Park, Door County, Wisconsin. LaSalle-Peru Township High School in LaSalle, Illinois has the mascot of the Cavaliers (Cavs) and Lady Cavaliers (Lady Cavs). ^ The Order prohibited a man taking final vows before the age of twenty-five. He was still considered a part of the Order as he was later barred to his inheritance. ^ This was apparently from the French la Chine, for China. The reference is unclear, but may refer to his intent to find a route to the orient. ^ There is some disagreement about accepting Navasota as the site of La Salle's death. The historian Robert Weddle, for example, believes that his travel distances were miscalculated, and that he was murdered just east of the Trinity River. ^ Parkman, Francis (1869). "Chapter 1: Cavelier De La Salle". The Discovery of the Great West. France and England in North America. Vol. 3. Boston: Little, Brown and Company. p. 1. ^ a b c Dupré, Céline (1979) . "Cavelier De La Salle, René-Robert". In Brown, George Williams (ed.). Dictionary of Canadian Biography. I (1000–1700) (online ed.). University of Toronto Press. ^ Margry, Pierre. Découvertes et établissement des Français dans l'ouest et dans le sud de l'Amérique Septentrionale [Discoveries and French Settlement in the West and South of North America] (in French). Vol. 2. p. 88. ^ Dupré, Céline (1979) . "Roybon D'Allonne, Madeleine De". In Hayne, David (ed.). Dictionary of Canadian Biography. II (1701–1740) (online ed.). University of Toronto Press. ^ It is puported by some that he journeyed via a stream passing six or seven leagues south of lake Erie, which was a tributary of the Ohio, to that river, thence downstream so far as the Falls of the Ohio below the site of the modern city of Louisville, where his crew abandoned him, and he returned to Canada on his own. ^ Parkman, Francis. France and England in North America, Volume 1. New York: Library of America, 1983, p.
^ "The History of Fort Frontenac". The Cataraqui Archaeological Research Foundation. Retrieved November 4, 2015. ^ "Plaque information: René-Robert Cavelier de La Salle at Cataracoui". Ontario Heritage Trust. Archived from the original on September 24, 2015. Retrieved November 4, 2015. ^ "Fort Crevecoeur – built in 1680". Fort Crevecoeur Park and Campground. April 1, 2015. Archived from the original on November 12, 2015. ^ a b c Weddle, Robert S. (October 30, 2011). "La Salle's Texas Settlement". Handbook of Texas Online. Texas State Historical Association. Retrieved November 4, 2015. ^ "La Salle Archeology Projects". Texas Historical Commission. August 4, 2015. ^ Parker, Dan (1996). "Raising The Belle – La Salle's last ship". Corpus Christi Caller-Times. Archived from the original on March 16, 2005. ^ The Wreck of the Griffon, Kohl and Forsberg, 2015. Seawolf Publishing Co.
^ Ashcroft, Ben. "Le Griffon: The Great Lakes' greatest mystery". The Detroit Free Press. USA Today. ^ Randall, Frank Alfred; Randall, John D. (1999). History of the Development of Building Construction in Chicago. University of Illinois Press. p. 271. ISBN 0-252-02416-8. Keiley, Jarvis (1913). "René-Robert-Cavelier, Sieur de La Salle" . In Herbermann, Charles (ed.). Catholic Encyclopedia. New York: Robert Appleton Company. Whinery, Charles Crawford (1911). "La Salle, René Robert Cavelier, Sieur de" . In Chisholm, Hugh (ed.). Encyclopædia Britannica (11th ed.). Cambridge University Press. Parkman, Francis (1892). 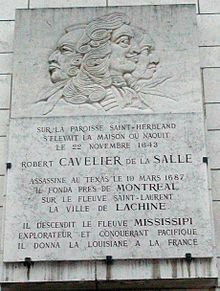 "La Salle, Robert Cavelier, Sieur de" . In Wilson, J. G.; Fiske, J. (eds.). Appletons' Cyclopædia of American Biography. New York: D. Appleton. Joutel, Henri; Foster, William C.; Warren, Johanna S. (1998). The La Salle Expedition to Texas: The Journal of Henri Joutel, 1684–1687. Austin, TX: Texas State Historical Association – via Questia (subscription required). ISBN 0-87611-165-7. Justin Winsor (1884). Narrative and critical history of America vol. IV, pages 200–246. Includes several maps drawn by La Salle. Wikimedia Commons has media related to René Robert Cavelier de La Salle.